See our Brochure to find out more about this journey of a lifetime. 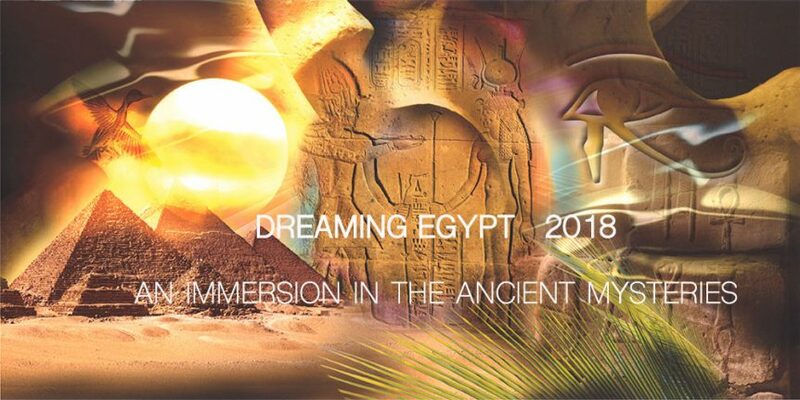 Listen to Victoria in a conversation about the mystical alchemy of sacred Egypt, and the power of answering it’s call at this time in our evolutionary journey as a species. • Balance of payment for the trip is due no later than September 1, 2018. • If using Paypal or a credit card a 4% fee is added to cover costs — Deposit with PayPal or credit card is $942. • All entrance fees to temples and tombs. • Complete our online application. • Or to use Paypal, send your paypal payment to victoria@emanationofpresence.org in Paypal. • To wire transfer connect with victoria@emanationofpresence.org for banking details. Day Two October 17th: At dawn we drive up to the Giza Plateau and proceed in silence for a private ceremony and meditation between the paws of the Sphinx. Visiting at such an early hour allows us to experience the energies of this iconic plateau and its three mysterious pyramids privately before we return to the Mena House for breakfast. In the afternoon we will drive into the countryside to visit the tombs and shrines of the oldest Egyptian Pyramid at Sakkara. We will also experience the mysterious chambers of the Serapeum and its underground passageways filled with 24 granite sarcophagi weighing 70 tons each. We will then have a late lunch on the Sakkara Road. Day Three October 18th: After breakfast we check out of the Mena House and visit the Cairo Museum with its thousands of statues and artifacts from the ancient sites of Egypt including all the treasures found in King Tut’s tomb. Lunch will be at a local restaurant and then we will visit the oldest souk in Egypt called the Khan Il Khalili. Afterwards we head to the airport for our flight to Aswan. Day Four October 19th: Leisure morning to settle in on the Afandina. After breakfast we will meet together for meditation and discussion. Following lunch will take a small boat into the cataracts of the Nile to the Island of Soheil for a ceremony dedicated to the Nile and the healing of the water on the planet. Day Five October 20th: In the pre-dawn hours we will take a ferry ride to the ancient Temple of Philae dedicated to the goddess Isis. Here we enter the sanctuary for a private ceremony and then go to the original gate of the temple to offer blessings and be purified in the Nile. This visit alone is one of the great highlights of the trip. Following the visit, we return to the Afandina for breakfast and then begin our sail along the Nile to the Temple of Kom Ombo for an afternoon visit. This temple is the only one dedicated to two gods, Sobek and Horus, representing the shadow and the light. Day Six October 21st: We awaken on an island outside Kom Ombo to enjoy our breakfast in the pastoral setting of ancient Egypt. After breakfast we continue our journey down the Nile towards Edfu, the temple dedicated to the god Horus. Day Seven October 22nd: A day of sailing the Nile, stopping at the ancient city of Esna as we go through the locks. This gives us time to rest, meditate and integrate all that we’ve experienced thus far. Possibly an opportunity to take a dip in the Nile itself. Day Eight October 23rd: Morning sail to Luxor. After lunch visit Karnak Temple, the largest temple complex in the world. A highlight is the visit to the ancient statue of the goddess Sekhmet, who has stood in the same site for 3000 years. Evening visit to Luxor Temple. Day Nine October 24th: Early morning visit to the West Bank to the astoundingly beautiful funerary temple dedicated to Hatchetsut. Then we enter he famous Valley of the Kings to see the vivid reliefs on the tomb walls. Afterwards we take a short drive into the Valley of the Baboons and visit the Tomb of Ay for a meditation. Return to the Afandina for lunch. The afternoon will be free to explore Luxor. That evening will be our farewell party to the crew of the Afandina. Day Ten October 25th: Early morning drive to the ancient town of Abydos to visit the mystical Osirion where the original Flower of Life appeared. We explore the exquisite Temple of Sety 1 as well as the adjacent temple dedicated to Ramses II. We will visit the ancient monastery where the tomb of Om Sety is buried and check into the Flower of Life hotel for lunch and dinner. Day Eleven October 26th:After breakfast we drive to the Temple of Dendera dedicated to the goddess Hathor who represents music, love, joy, sensuality and the heavens. After our visit we will drive to Luxor to check in to the Sonesta St George Hotel overlooking the Nile. Day Twelve October 27th: Morning free. Fly back to Cairo for our visit to the Great Pyramid. Day Thirteen October 28th: Our final day to do some last minute shopping. Closing Circle and Farewell Banquet. Day Fourteen October 29th: Depart for home.